JACKSON — Nature’s mosquito control engineers — bats — will have more housing options around Consumers Energy’s hydroelectric sites around Michigan thanks to the efforts of a Boy Scout and scrap auto parts from General Motors. 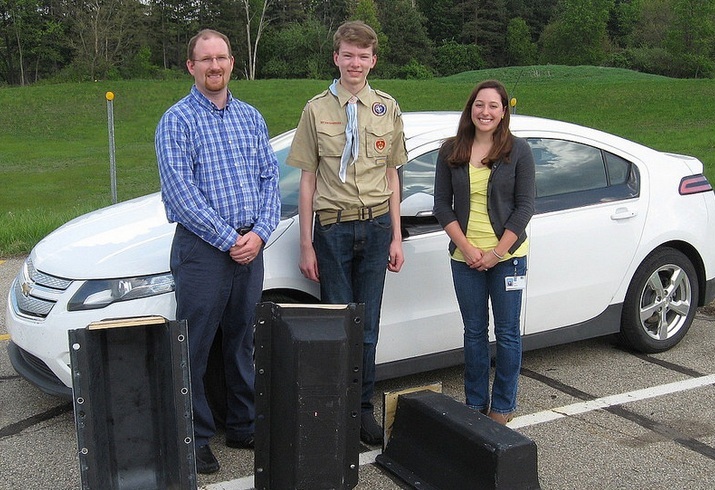 For an Eagle Scout project, Matthew Netherland and helpers built 22 bat boxes out of scrap Chevrolet Volt battery covers donated by GM — boxes Consumers Energy plans to install on its hydro properties. About 100 or more bats can live in each bat box, which includes five chambers. Netherland, a friend and two adult mentors helped build 30 bat boxes in about two months, 22 of which will be installed by Consumers Energy. GM has now built more than 520 wood duck, bat and bluebird nesting boxes from Volt battery covers, with many peppered throughout its facilities’ grounds. Consumers Energy has hydroelectric generation dams along the Au Sable River in northeast Lower Michigan, and the Grand, Kalamazoo, Manistee and Muskegon rivers in West Michigan. The utility provides natural gas and electricity to 6.5 million of the state’s 10 million residents in all 68 Lower Peninsula counties.